The 2013 EuroBasket was the 38th event of the nature and it was held in Slovenia between the 4th of September and the 22nd. In total, 24 teams battled through to the main event. The 2011 event was hosted in Lithuania, an event which Spain clinched their second title. Spain were one of the teams at the 2013 event, aiming to retain their crown. 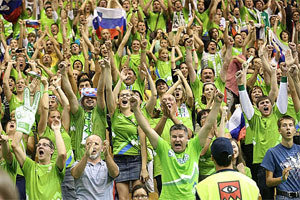 Slovenia qualified as host nation and the remaining teams were automatically qualified due to participating at the 2012 London Olympics or through being part of the qualification process for the Olympics. This left 16 places up for grabs and the qualification process took place between August and September in 2012. 31 teams were placed into 6 groups, one group of 6 teams and 5 groups of 5 teams. The top 2 teams from each group qualified automatically and the top 4 ranked third placed teams (based on win percentage) qualified as well. All of the qualifying teams were placed into 6 different pots with one team from each pot being placed into one of the four groups that made up the first round. The group winners included Montenegro, Germany and Croatia. The other group winners were Italy, Poland and Bosnia & Herzegovina. The runners up in the groups were Israel, Sweden and the Ukraine. Georgia, Finland and Turkey were the other second placed teams in the group. These teams were joined by the top four ranked teams in third position. These teams were Belgium, Latvia, Serbia and the Czech Republic. This finalised the 24 teams that would play out for EuroBasket 2013 in Slovenia. The games in Group A were played at the Tivoli Hall in Ljubljana and the group consisted of France, the Ukraine, Belgium, Great Britain, Germany and Israel. The three qualifying teams were France, Ukraine and Belgium. The games in Group B were played at the Podmežakla Hall in Jesenice and the group consisted of Serbia, Latvia, Lithuania, Bosnia & Herzegovina, Montenegro and Macedonia. The three qualifying teams were Serbia, Latvia and Lithuania. The games in Group C were played at the Zlatorog Arena in Celje and the group consisted of Spain, Croatia, Slovenia, Czech Republic, Georgia and Poland. The three qualifying teams were Spain, Croatia and Slovenia. The games in Group D were played at the Arena Bonifika in Koper and the group consisted of Italy, Finland, Greece, Sweden, Turkey and Russia. The three qualifying teams were Italy, Finland and Greece. The next round saw the 12 qualifying teams, split into two groups of 6 teams with the top 4 teams progressing. These groups were labelled E and F.
The games in Group E were played at the Arena Stozice in Ljubljana and the group consisted of Serbia, Lithuania, France, Ukraine, Belgium and Latvia. The four qualifying teams were Serbia, Lithuania, France and Belgium. The games in Group F were played at the Arena Stozice in Ljubljana and the group consisted of Croatia, Slovenia, Italy, Spain, Finland and Greece. The four qualifying teams were Croatia, Slovenia, Italy and Spain. In the semi-final the winners of the top two games played against each other, while the winners of the bottom two games played against each other in the other semi-final. This meant that the quarter finals played out in the following manner. Spain defeated Serbia by a score of 90 to 60. France defeated Slovenia by a score of 72 to 62. Croatia defeated Ukraine by a score of 84 to 72. Lithuania defeated Italy by a score of 81 to 77. The four losing teams broke off for the 5th placed bracket, which panned out with Slovenia defeating Serbia by 92 to 74 and Ukraine defeating Italy by 66 to 58. The seventh placed playoff- saw Serbia defeat Italy by 76 to 64. The fifth placed play-off saw Slovenia defeat Ukraine by 69 to 63. Spain, France, Croatia and Lithuania were the four semi-finalists, with the semi-finals panning out with France defeating Spain by 75 to 72 after over-time and with Lithuania defeating Croatia by 77 to 62. In the third placed play-off game, Spain clinched third place by defeating Croatia 92 to 66. The final took place on the 22nd of September and France won out winners by a score of 80 to 66 over Lithuania. 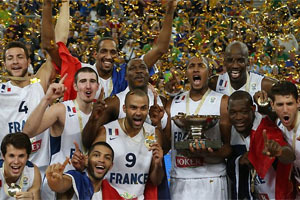 This was France’s first ever triumph in the EuroBasket event. This was France’s 36th appearance at the EuroBasket event, making them the team with the most appearances, so it was about time that they triumphed. The Most Valuable Player award for the tournament was awarded to Tony Parker from France. Parker achieved a PPG of 19.